At last, the summer is finally here. Just another excuse to drink.....outside! A tri level bar with the outdoor patio upstairs. Gets over-crowded on the weekends. A cozy intimate Italian eatery with a romantic backyard. Located at the rooftop on the 18th floor. An upscale vegan bistro with a charming rooftop patio. A casual bar with a great view of the Empire State Building in Koreatown; located on the 14th floor. A swanky rooftop bar surrounded with tropical plants in Midtown West. Pricey drinks with beautiful people in Midtown East. Overlooks East River and in Kips Bay Neighborhood, serving modern American fair. A speak easy lounge bar with an English patio. Ignore the interior part of the bar, head straight out to the rooftop joint with pricey drinks and a great view. Dressy attire recommended. No cover charge. Rooftop beer garten. Highly recommended. 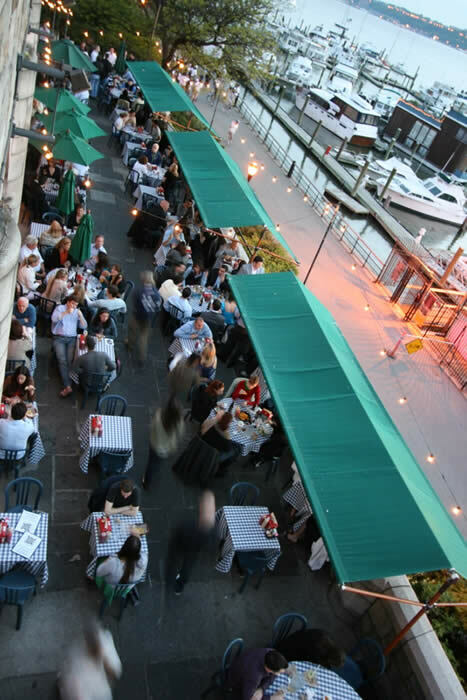 A relaxing evening hangout bar facing the Hudson River. An upscale joint; an ideal place for a date night. Communal tables with eclectic ambiance. Serves great tapa and has an outdoor cafe. A wine bar and Italian fair. Serves brunch. Pretty back patio. 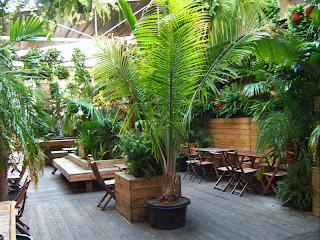 A beautiful spacious outdoor terrace but pricey drinks. 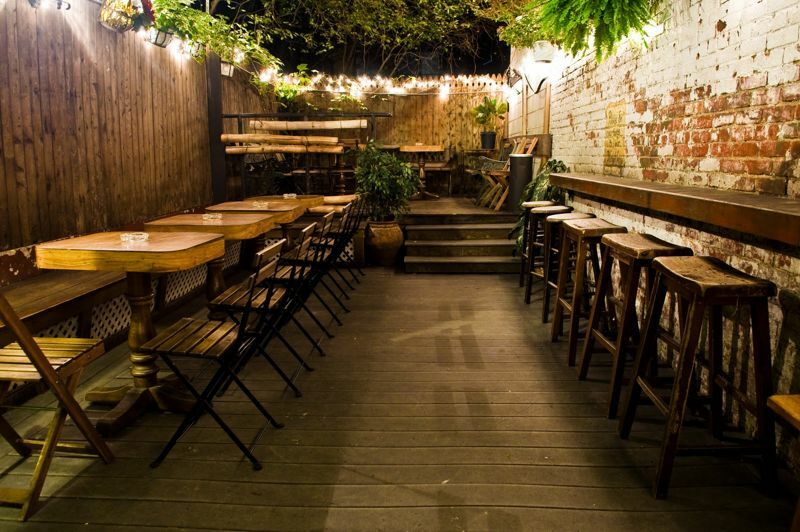 An affordable German dining and beer establishment with a beer garden ambiance. Local Irish pub with a backyard beer garden. Drink specials and appetizers during happy hours. Seafood restaurant with street seatings and a quiet outdoor patio. Burgers and southern cooking with a great back patio. Happy hour everyday til 8pm. A 30 something crowd bar with badass burgers and nice patio. An affordable Sports lounge bar with late night dancing; perfect for lazy Sunday drinking at one of the 2 rustic porches. It's all about drinking here at this casual Aussie themed bar with a $20 two-hour free flow of drinks. It has a small dance floor with a back patio. 3 floors of rustic charming restaurant specializes in Asian fusion food. 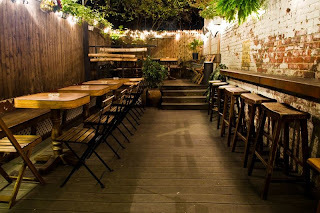 An effortless cool restaurant/bar with good food and a memorable backyard. A lounge bar specializing in Belgium craft beer. Lounge and club with an awesome rooftop; attracts hipster types on the weekends. Ignore the cheezy decor and mediocre Mexican food, focus on happy thoughts- dirt cheap drink specials on the rooftop. Make sure to order at the bar to get the discounts. Nestled at the southern most corner of Battery Park with a panorama view of New York Harbor, including historic Ellis Island and The Statue of Liberty. A great rooftop patio facing the East River. Attracts older crowds. An upscale Chinese fusion restaurant. Eatery with a lounge feel and a night club. A great rooftop patio. Nothing pretentious about this place with a terrace on a boat looking out the perfect view of Hudson River. It's all about the view of the Hudson River here at the outdoor cafe. Serves new-wave American fairs and brunch. But the best part of it all is drinking out in the garden. 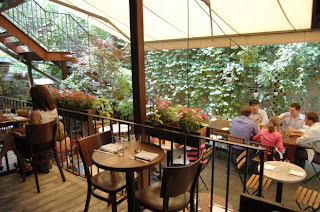 Ubber overpriced upscale French dining with a romantic terrace. A spacious outdoor patio. You may not necessary get the best service. A quiet lounge bar with an eclectic industrial vibe. Relaxed bar with regulars and friendly bartenders. No kitchen but has an awesome garden. May be a bit difficult to find at first. Serves soul Latino and Caribbean inspired food and drinks. Wow! This is totally awesome blog! I love going to bars and clubs. I wish I could be there in and enjoy cool breeze and party nights at best roof top bar nyc .